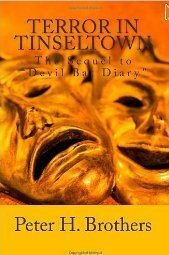 Terror In Tinseltown is the sequel to Devil Bat Diary. And again Peter H. Brother takes the unique characters on a twisted and suspenseful ride. This time it’s in Hollywood among the snobbish, the glamorous, and the not so glamorous, as they try to solve a string of murders for the newspaper they work for in Chicago. Strange things start happening while Johnny Layton investigates, and someone is out to stop them... no matter what the cost.For some reason I found the sequel a little adverb heavy. I don’t recall this in Devil Bat Diary. But somehow it’s fitting and in comparison to the story as a whole, this was the only thing that struck me as negative. The story was well paced and keeps the reader wanting more.The author does a great job of painting a scene of Hollywood in the 1940’s. You’re taken back to a time when movies made the world feel wholesome. You pepper in the absurd acts of the characters, the abandon of manners, and the constant banter of two grown men, and it takes on a new life I found comical.